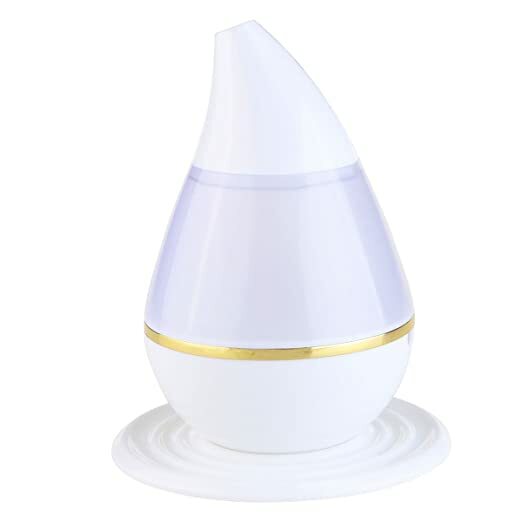 ♥ ULTRASONIC COOL MIST TECHNOLOGY: Safely moisturizes the air for 10 to 24 hours of continuous operation (depending on mist control setting), humidify the air in the room during summer and winter, refresh the air quality we breathe, adjusts the temperature. ♥ EFFCIENT MIST OUTPUT: One control button to easily adjust mist output in any direction. Longer mist stream provides perfect humidifying coverage and leaves no condensation on the floor. ♥ PEACE and QUIET: Enjoy complete serenity thanks to the improved inner structure that makes the humidifier basically noiseless, get more restful sleep. ♥ AUTOMATIC SHUT-OFF: Safely turns humidifier off when water level is low or the water tank is removed. ♥ 7-Colorful LED design, warms atmosphere in the room by adding perfume or essential oil in the atomizer, beautiful decorations for yoga, bedroom, living room, bathroom and office, or a gift to you friend. Changing light color automatically, or you can choose one color as you want. Water-soluble essential oil can be used in this product, giving you a SPA at home. The adjustment of the time mode and the amount and intensity of mist. Ultrasonic technology turning the water or fragrance solution into mist. - Material: ABS + PP. - Size: About 12 * 15 * 5cm(L * W * H). - Rated Voltage: DC 5V 500mA. - Vibration Frequency: About 2.4MHz. - Adapt Area: 8-12 square meters. - Humidify: humidify the air in the room during summer and winter, refresh the quality of air we breathe, adjusts the temperature in the room. - Beauty: refreshes skin and can be taken as a skin care, keeps skin healthy and moist. - Purify: neutralizes static, reduce infection of skin. - Relief: aroma therapy, relieve strain and ease stress. - Decoration: warms atmosphere in the room by adding perfume or essential oil in the atomizer. - Applications: Beauty salon, SPA, Yoga, Bedroom, living room, conference room, office, reception center, corridor, pet room, toilet, baby room, hotel, hospital or any other private/public places. Copyright © 2017. Winomo All rights reserved.